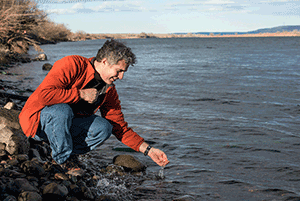 George Bonheyo leads PNNL’s biofouling research. Wherever there is moisture, microscopic communities of organic matter and cells stick together, adhere, and grow on wet surfaces. Within seconds of a surface entering water—whether it’s fresh, brackish or marine—the process of biofouling begins. Researchers at PNNL are now leading research to mitigate biofouling and its impacts on the environment and industry. For the commercial maritime shipping industry, biofouling is the leading cause of aquatic invasive species transport. Even a small amount of biofouling adds to shipping fuel costs and greenhouse gas impacts. A mere 50 microns—the average diameter of human hair is 50 to 120 microns—of added surface roughness from biofouling can increase drag on a 1,200-foot-long container ship up to 22 percent. In fact, says PNNL Senior Research Scientist George Bonheyo, it’s hard to find an industry not impacted by biofouling and biofilms. For the energy sector in the United States, the estimated cost of biofouling at power plants is about $50 billion per year, primarily for cleaning heat exchange systems. A 250-micron thick biofilm can reduce the efficiency of a heat exchanger by 50 percent. 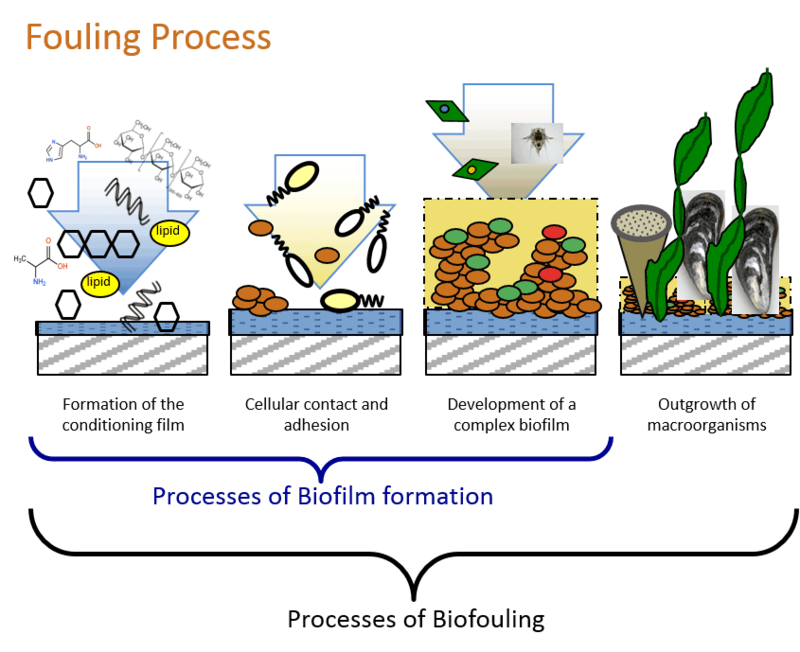 The processes of biofilm formation and biofouling. While nature has strategies for repelling these microbial squatters from living and growing on the surfaces of fish, marine mammals, and other aquatic creatures, manmade surfaces have no natural defenses. a variable-speed seawater raceway for analyzing how water velocity across surfaces impacts the performance of antifouling materials. In July 2018, with colleagues from Sandia National Laboratories and the Department of Energy, PNNL Senior Research Scientist George Bonheyo led a series of workshops with the maritime industry to more fully understand the issues and challenges posed by biofouling. This followed the 19th International Congress on Marine Corrosion and Fouling (ICMCF), in which Bonheyo was co-organizer and session chair for a special session entitled “More than Ships” that examined fouling and its impact on energy systems, sensors, and desalination plants. The conference brought together scientists to identify the unique challenges and potential mitigation strategies for fouling on marine renewable technologies, desalination facilities, sensor systems, mining operations, and more. Biofouling, says Bonheyo, has been a problem for as long as people have navigated lakes, rivers, and oceans. Copper ship hulls, tar pitch, and arsenic paints were each a part of toxin-based preventative strategies. As recently as the 1970s, tributyltin (TBT) biocides were blended into paintable coatings. By 2008, it was banned on ships worldwide. Toward that end, the PNNL team at MSL is working on a program for the DOE Water Power Technologies Office with Sandia National Laboratories, the National Renewable Energy Laboratory, Montana State University, and Florida Atlantic University. Their goal is to improve the performance of composite materials for use with marine renewable energy systems. To date, Bonheyo and his colleagues, including MSL scientist Eric Winder and PNNL-Richland scientists Shane Addleman, Curtis Larimer, Jon Suter, and Chris Barrett have two awarded patents and two patents pending for environmentally friendly antifouling coatings and analytical methods or tools. One of those PNNL-innovated coatings is called SLIC, short for Superhydrophobic Lubricant Infused Composite. As the name implies, SLIC is super-slick—10 times more than Teflon. Its unique surface nanostructure holds in place a lubricant-like oil. “Having this liquid layer on the interface makes it much less attractive for organisms to settle on it,” said Larimer, a PNNL materials scientist. 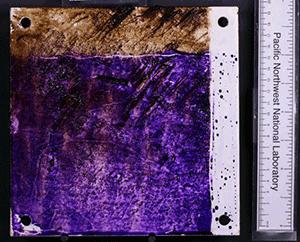 Shown here is a test coupon with a heavily biofouled and stained section and clean region (right), demonstrating foul-release technology. SLIC is paintable, bio-resistant, durable, scalable, and moderately self-healing if scratched. It can also be manufactured from cheap, readily available materials, using common industrial processes. 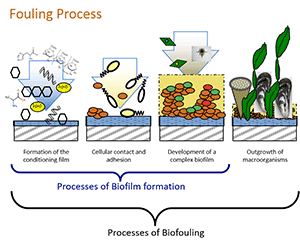 PNNL experts in a dozen disciplines are working on the issue of biofilm and biofouling prevention including two new DOE Technology Commercialization Fund awards to further SLIC in hydropower and in marine renewable energy applications. PNNL is also working with colleagues from Heriot-Watt University in Scotland, La Pontificia Universidad Católica de Chile, France Energies Marines, and other institutions to develop standardized test methods for assessing anti-biofouling coatings and materials that may be used with marine renewable energy systems, such as tidal turbines, wave energy converters, and offshore wind farms. In the struggle to keep manmade surfaces clear of colonizing microbes, “eventually, biology wins,” said Larimer. But the next generation of hydrophobic coatings, he added, may offer new solutions.